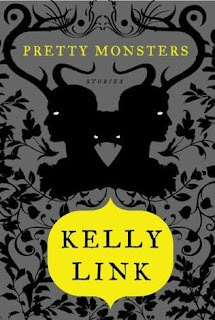 Since we're on the anthology kick (I just love them--they're great if you need a quick read, or just want to try out a new author before buying their novels), here's another book of short stories, all written by Kelly Link, called Pretty Monsters. In her new collection of stories, Kelly Link gives readers a wide array of spooky, ironic, and sometimes downright funny short stories that will make them shiver--from Miles's accidental excavation of the wrong girl's grave when he sets about to dig up poems placed in his dead girlfriend's casket, to the terrifying and tech savvy monster who terrorizes a summer camp. Link's style ranges from quirky to gruesome to downright creepy, and her collection offers a little something for everyone with a unique and highly imaginative quality. Since the content of the book is so varied, some readers might have a little trouble sticking it out through all the stories, but Link's characters are very relatable despite the strange circumstances the find themselves in. However, perhaps the best part about these stories is Link's talent for deceiving twists and surprise endings, which make each and every story all the more enjoyable--and startling. Remember, be sure to enter this week's Halloween contest!